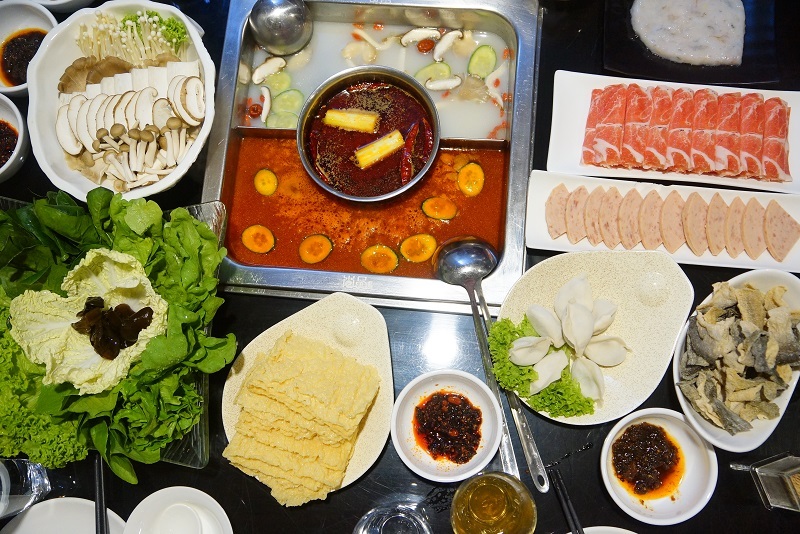 The Hai Di Lao started a whirl of feverish about hot pot and is spreading like wildfire, triggered similar establishment to compete in the hot pot business. 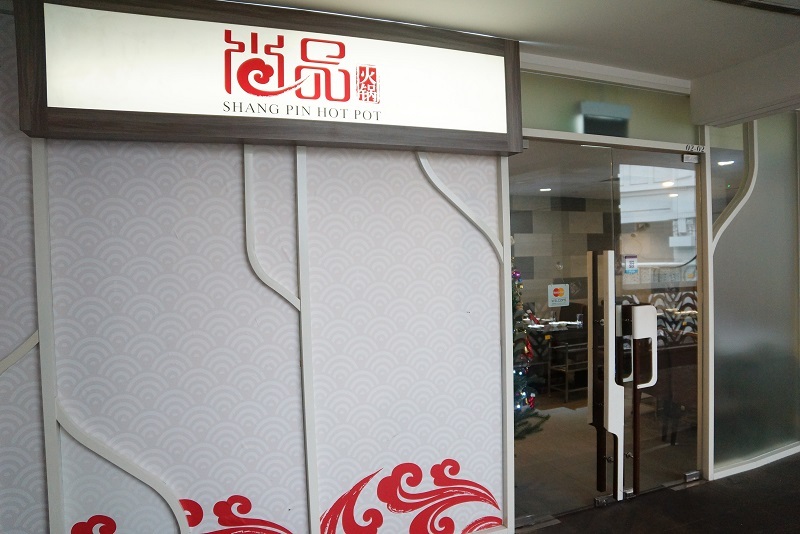 Shang Pin Hot Pot is probably one of the strongest competitors to Hai Di Lao with its reminiscent in the food standard and hence worth to check it out. We had the experience with Hai Di Lao Hot Pot for the impeccably good service and food quality though price is quite steep. So, how is Shang Pin Hot Pot fair against Hai Di Lao Hot Pot? First of all, there is no manicure or free drink services provided for the waiting queue compared to Hai Di Lao but this is not critical at all. Ambience is not as cosy or conducive as well for it relatively unsophisticated setup. We opted for the three type of soup base, the all-time popular Black Chicken, tomatoes and the Sichuan Mala. The milky white black chicken broth was inundated with piquant flavour, fairly close to Hai Di Lao with its inspiring tangy taste. Tomatoes base was equally good here with the well balanced sweetness and sourness. Sichuan Mala was only at mild level but already fiercely hot and for those not accustomed to the spiciness, you may need an fire engine to put off the fire in the mouth. Some of the dishes already sold out and don’t have a chance to try it out, example the mantou and Kungfu noodles. All the portions served are of standard size but good enough for three to four diners so be more prudent when you place the order to avoid wastage in the end. The dipping sauces are something worth to mention, the twenty over different types of sauces and condiments are masterfully created to ensure its please every of the fastidious taste buds. From the seafood sauce, chili sauce, mushroom sauce, beef sauce, soyabean sauce to the BBQ sauce, every single sauce we tried is there to impress you. 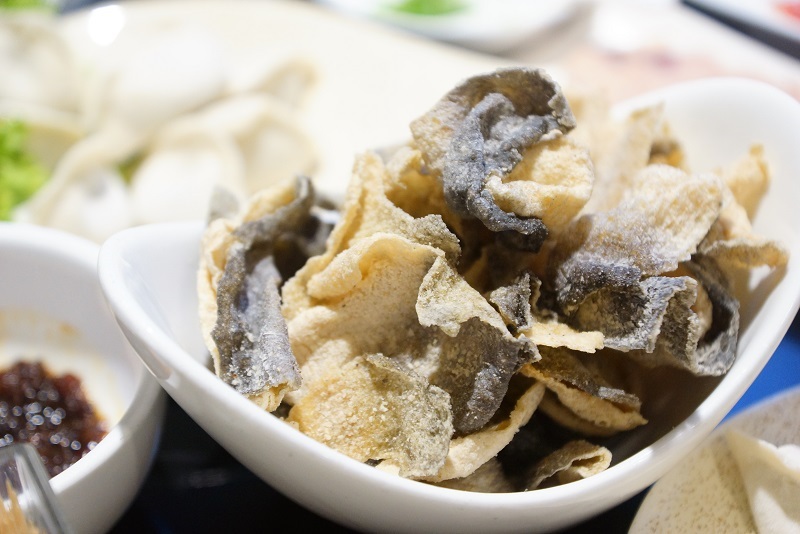 The deep fried fish skin was quite blank and already losing some of the crispiness due to the high humidity environment when served. We went for the black pig pork slices for its much tender and tasty meat. The pork was thinly sliced with the nice intense marbling, a dip and quick searing in the boiling hot broth giving it a nice texture that is very pleasant in taste and the bite. The chives and meat dumping was juicy and tantalizing that we have to order total of three servings to meet our cravings. 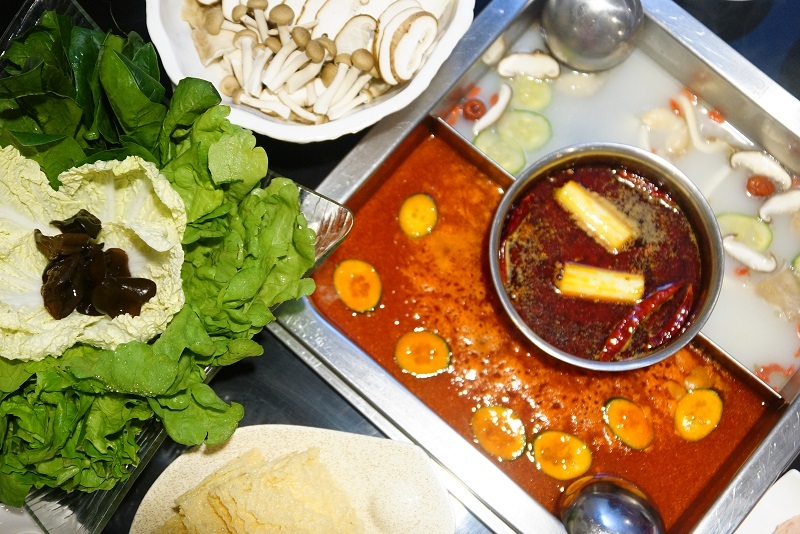 Shrimp paste ($12), Fried Tofu Skin ($4), Pork balls with mushroom ($8), lunchon meat ($6), fresh vegetables platter ($12) and mushroom platter ($14) were excellent in both the freshness and quality, not in any way less inferior to the Hai Di Lao hot pot. 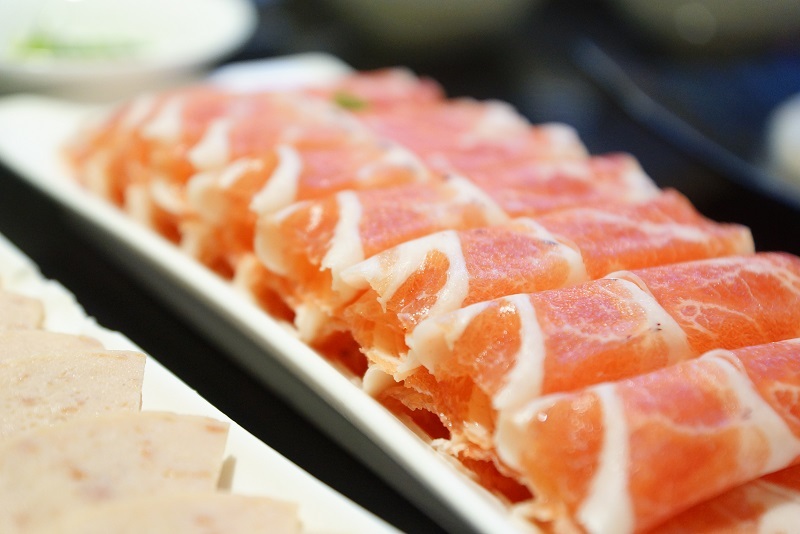 The service and environment may not be top notch at Shang Pin Hot Pot compared to Hai Di Lao hot pot, however, the food quality and pricing could have made up for the gaps. We paid about $91 for two persons with less variety and smaller serving size when we dined at Hai Di Lao Hot Pot, average about $45 per head. However, at Shang Pin Hot Pot,more varieties of food were ordered and the meal only cost us $148 for six pax! That translates into less than $25 per head and a whopping 45% difference in the price! One thing for sure, all of us have our tummy stretched over the limit. 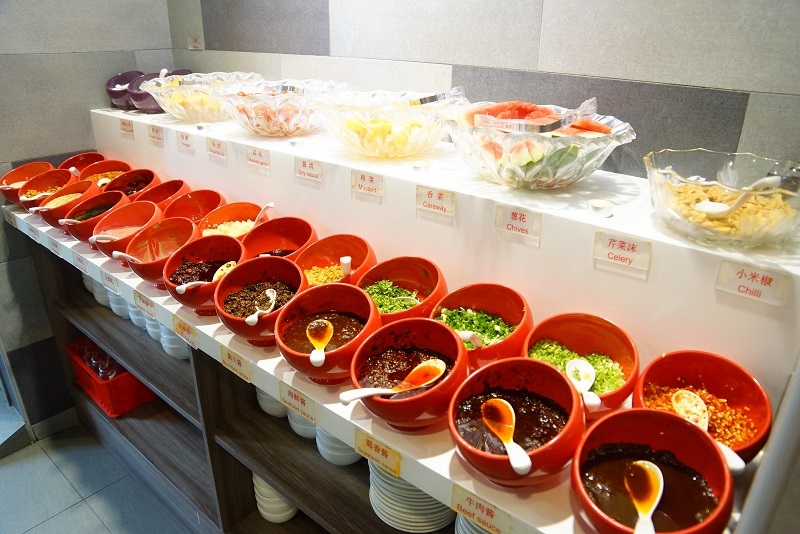 If you solely interested just on good food and good price, go for Shang Pin Hot Pot directly, however, if you plan to be treated like the VIP and willing to pay for the seamless service, Hai Di Lao Hot Pot will be a clear decision.